Megha Tewari, M.D. is board certified by the American Board of Family Medicine and received her medical degree from the Government Medical College of Chandigarh in Chandigarh, India. She completed both her residency and fellowship at Sparrow Hospital in Lansing, Michigan, where she served as chief resident and completed her fellowship with a specialty in geriatrics. Dr. Tewari has always had a passion for medicine, but she was truly influenced by her family members, namely her uncle in India, who was a family medicine physician and exemplified the gratifying nature of the job. She specializes in geriatrics, as she believes it is important to take care of the elderly population that has been through much in their lifetime and deserve respect and compassion from caregivers. Her other clinical interests include in-office procedures such as skin biopsies and joint injections. 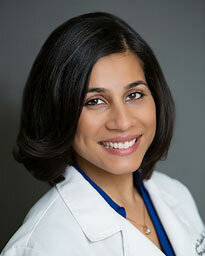 A compassionate figure, Dr. Tewari considers herself a close friend, a confidant, and a health advisor to her patients. She likes guiding her patients and working with them to achieve healthy futures. The part of her job that she feels is most rewarding is helping patients work towards resolving their medical conditions and seeing a smile on their face at the end of the day. Dr. Tewari is a resident of The Woodlands and is married to an ER physician. An avid foodie, she enjoys cooking, and she also loves to participate in Zumba dance. Dr. Megha Tewari practices at Memorial Hermann Medical Group Imperial Oaks in North Houston. Dr. Megha Tewari practices family medicine at Memorial Hermann Medical group Imperial Oaks in North Houston. The weather has been messing with people all around Montgomery County, but it's also the peak of flu season. How do you know if you have flu, cold, allergies or simply a stomach bug? "Flu starts with very generic symptoms like runny nose, congestion, headache, body aches, and fever," said Dr. Megha Tewari, a family medicine physician at Memorial Hermann Medical Group Imperial Oaks.